ELSA Home Inspections works with home buyers to conduct thorough evaluations of houses located in Central Florida. The data they provide allows buyers to make an informed decision about the house they’re considering for purchase. The home inspections field is crowded with numerous companies offering their services. ELSA Home Inspections wanted to rise to the top of search engines for home buyers searching for inspection services in the cities of Tallahassee, Jacksonville, Tampa and Orlando, Florida. To obtain high search engine ranking, they knew they needed copy that included the right keywords. 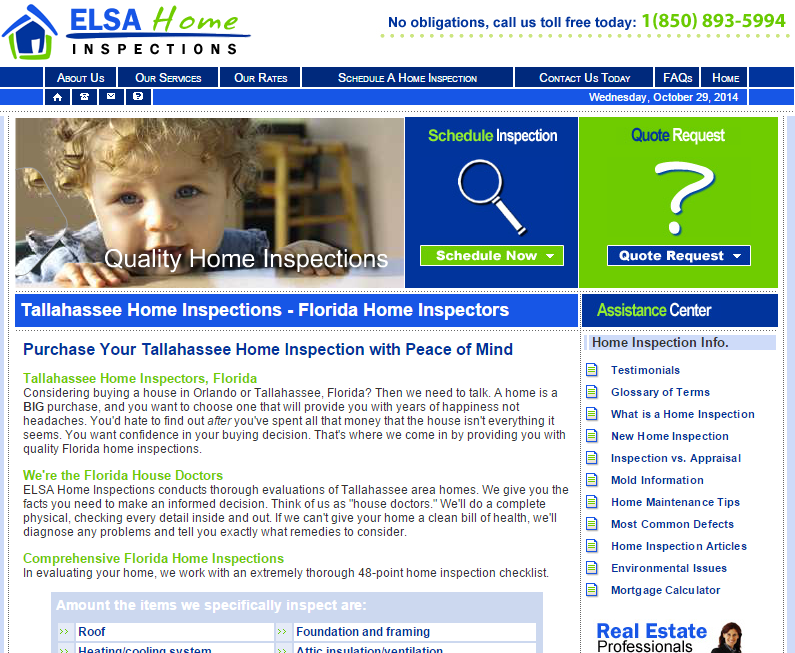 ELSA Home Inspections turned to Susan Greene, an Orlando copywriter, to write content for their website. In analyzing the competition, Susan realized ELSA Home Inspections needed much more than just the standard Home, About and Contact Us pages. To rank high on Google, they needed numerous articles about the home inspection topic as well as lots of FAQs and detailed lists of the services they provide, all of which Susan wrote. The website was launched and soon rose to the top of Google. Today, several years later, it still has excellent ranking and depends on that high placement for a steady flow of new customers. Need a website that puts your company at the top of Google? Let’s chat about your website today!